Game shows are one of the most popular style review and active lessons which teachers use in their classrooms. For myself, I started down the road of games shows when I first student taught back in 1998 and have used them ever since. All my game shows have elements in game play for both individual and team based questions. All the links for these games are on Teachers Pay Teachers. You will need an account in order to download them. Here are game shows free for download. Please share this with other educators and drop me a line if you found this successful in your classroom. ​Frazzle is a game similar to "$100,000 Pyramid" and the popular phone game "Heads Up". The main idea in this game is that the teacher does NOT provide the questions in the games but only provides the terms, people, etc. The students then have to get their teammates to identify them by giving clues. One of the most simplest of games but also one of my all time favorites. Answer a question, then enjoy a go at a classic children’s game. Do you select the middle space or do you need to play strategy in hopes of giving you a two way win? As the X’s and O’s are place, you soon realize this is not the game you remember as a child as this new version of Tic Tac Toe will bring many new surprises. My newest game show! Unlike almost all my others, this one requires you to get some supplies. The most important of these is a set of play money. The basic concept of this game is to ask students questions, award them money for winning, but then offer them "Deals" and challenges to take instead. This has been some of the most fun I have had with a game show in my class in a long time! ​A Price is Right style game show review. For any class at any level. This easy to play game show will make your students excited about demonstrating what they have learned and wanting to come back to class. This game show uses some of the classic games from the show like Dice Game, Plinko and the Showcase Showdown. A Jeopardy! style game show review. For any class, at any level. This easy to play game show will make your students excited about demonstrating what they have learned and wanting to come back to class. There are many out there, but this one has some of the best sounds and animations really making an interactive experience with your students. This PowerPoint game show template is based off of the classic "Card Sharks" TV game show. Students answer multiple choice questions in order to have the opportunity to "Play the cards" and guess if the next card is higher or lower. Regardless of the odds, the cards will sooner or later bring every group's hopes crashing down. What is NOT included but HIGHLY RECOMMENDED is a deck of oversized playing cards (check Amazon for these). This PowerPoint game show template is based off of the classic Jeopardy TV game show. Although at a first glance the review game appears very similar to Jeopardy, there are some very significant differences which I think helps to create a dynamic classroom experience. The premise is that certain questions give groups the opportunity to risk their points by going "Double or Nothing" after guessing a question correctly. and in the end my family won a trip to Mexico. Want to share one more Game Show connection in my life. 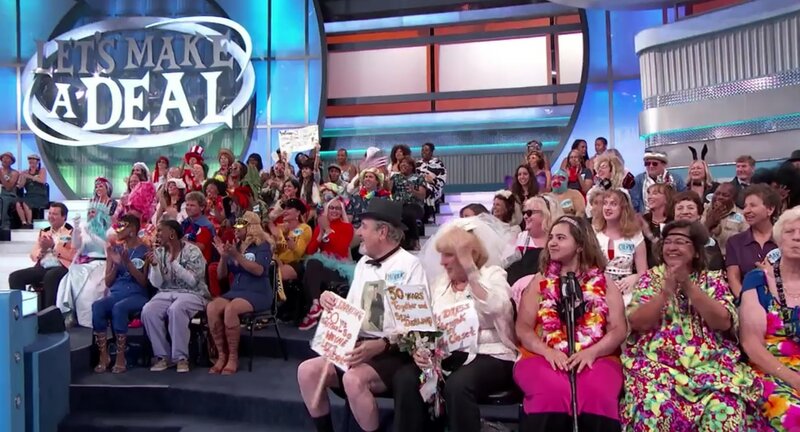 My parents recently got to attend a taping of Let's Make A Deal. They are the married couple celebrating their 50th anniversary. They didn't get chosen for a game but had a fun time anyway.